Life has been a bit busy lately for me, and the blog has suffered as a result. My apologies to my regular readers, and my sincere thanks to those who contacted me with concern and well wishes. One of the most frequently asked questions about solid fuel burning is: How do I get over-night or continuous burning for 8 hours or more? A short answer is: Not difficult if you have the correct stove, the correct fuel, and a little know-how. The trick to having a really comfortable house is continuous 24 -7 burning. It maintains the fabric of a house at a stable temperature. On off heating never really warms the floors, brickwork etc. it tends just to heat the air. When the heating switches off, the house rapidly cools down again to ambient temperatures. But when a house is heated continuously for several days without a break, the entire fabric of the building takes in heat and - like a great big storage heater - acts to maintain an even temperature. (4) Ignition to start the process in the first place. However, even before considering combustion efficiency, the first thing to look at is the device or vessel in which the combustion takes place. 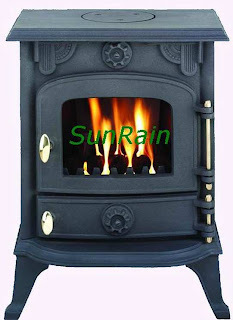 In this instance, a solid fuel stove or enclosed fireplace. To achieve efficient, controlled, and extended burn, you must have a good stove or enclosed fireplace. An essential defining factor in a good and efficient stove or fire with a fire front door is the facility to fully control the oxygen supply to the fuel. This is the single most important function. If the air can leak in through damaged doors, seal, air controls, or cracked casings, it will NOT be possible to fully control the combustion rate. This in turn will lead to inefficiency and possibly to the damage of the stove or fire grates. I will be looking at (1) Fuel, (2) Ash, (3) Adjusting Burn, (4) stoking etc in further posts. Keep a look out for the posts.